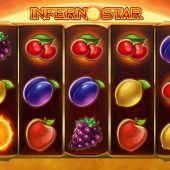 Inferno Star slot by Play'n Go is pretty much as basic as you can get as far a modern online slot mechanics go. This game is just one step removed from a slot which you just spin and see if a win drops in and the first look confirms it. You have a plain reel set over a giant Sun with simple sounds as you spin and stop the reels, in fact it's very close in appearance to those old Novomatic games such as Sizzling Hot, Ultra Fruits and Xtra Hot. Given the high volatility of those games, will this star make an inferno of our bankroll? 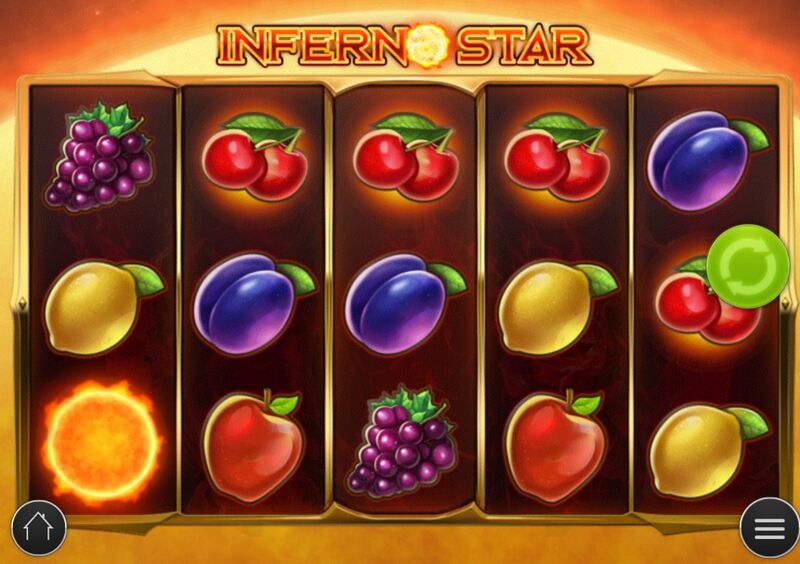 We only have 5 paying lines on Inferno Star slot which would suggest some decent 5-of-a-kind pays. When I tell you the top one is the Sun at 500x bet, Melon or Cherries 75x and Apple, Plum, lemon or Grape at 25x then it pretty much confirms a volatile game with low win frequency. I can also add there are no Wilds and no dedicated scatters, but we do get one feature although feature may be stretching the definition slightly! On reel 3 you may see a giant white hot Sun, the Inferno Star, appear on occasion. When it does you get respins, and if another appears on the other other 4 reels, another respin and so-on. These Inferno Stars don't normally appear on the other 4 reels, only for this respin feature. What is so great about this feature, I hear you ask? Not a lot in all honesty aside from the fact if you end up with an Inferno Star on all 5 reels you get a monster 2,500x bet pay! If you get 4, then 375x or for 3 you get 25x bet. Nothing for just 1 or 2.